Crystalline silicon solar cells with thicknesses around 200 μm dominate today’s photovoltaic market. Solar cell thickness reduction yields a huge potential, not only to save silicon material but also to increase the power conversion efficiency. Unfortunately, current wafering technology includes the slicing of a silicon block into wafers. The slicing induces a kerf loss of about 100μm silicon material for each wafer. Therefore, the amount of kerf loss increases upon reducing wafer thickness, contradicting the intentioned material saving. 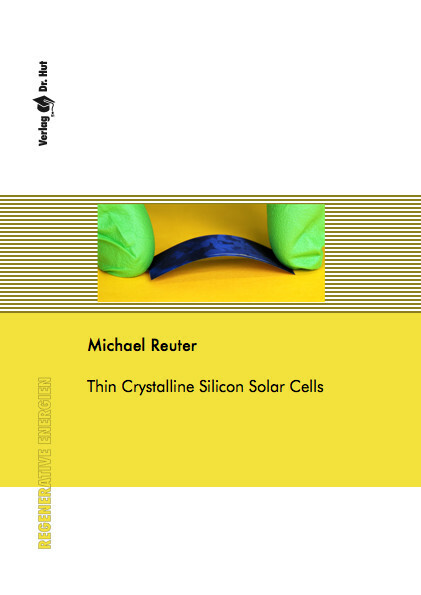 This work focuses on thin, crystalline silicon solar cells. The first part of this thesis analyzes the maximum efficiency potential for thin crystalline silicon solar cells. The Shockley/Queisser limit forms an ultimate efficiency boundary for solar cells with a single band gap, but neglects thickness dependent effects. Therefore, the solar cell dependence on thickness variation is discussed. Optimum light trapping and a good material quality enables solar cell efficiencies η exceeding η = 24 % for thicknesses W in the range 3 μm < W < 30 μm. The second part concentrates on multi-crystalline silicon solar cells from the only multi-megawatt scale wafer production which avoids wafer sawing: The String Ribbon process pulls the wafer directly from molten silicon. String Ribbon wafering does not suffer from kerf loss due to wafer slicing, and further allows for wafer thickness adjustment down to below 100 μm. This work thoroughly analyzes the material and solar cell properties and explores the efficiency potential of thin String Ribbon solar cells with a thickness of 120 μm. For the efficiency estimate, today’s industrial available processes and designs are considered and evaluated. String Ribbon wafers yield an efficiency η > 17 % by improved processing, and η > 18 % with bulk lifetime tailoring and an enhanced rear contact design. The third part of this work presents the current world record for thin film mono-crystalline silicon solar cells on epitaxially grown material. The 50 μm thin record solar cell features an efficiency η = 17 %. Based on a thorough material and solar cell analysis, the main limiting factors for solar cells from the transfer layer process is revealed: Firstly, the rear surface recombination. Secondly, a process induced bulk material contamination with platinum. Thirdly, resistance limited enhanced recombination probably due to damaging of random pyramid peaks during solar cell handling. Efficiency estimations show a huge potential for thin, free standing solar cells from the transfer layer process with efficiencies exceeding η > 20 %. Crystalline silicon shows a remarkable flexibility at thicknesses of 50 μm and below, allowing for new solar cell applications and markets.